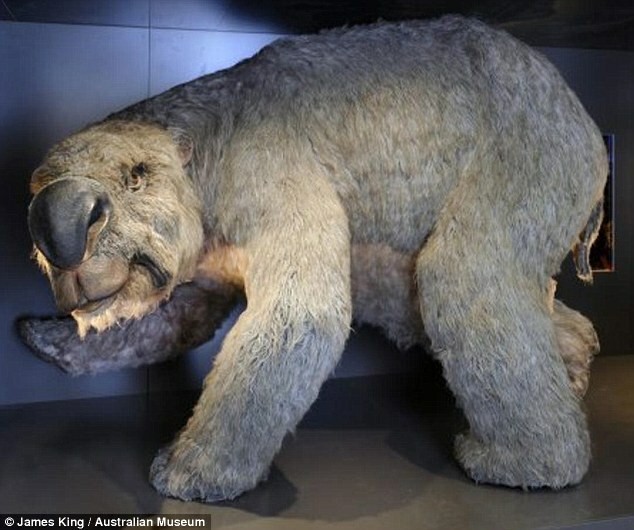 Giant Wombat Fossils found in Australia - This Prehistoric 14 foot monster complete skeleton was found in australia. today the news about this giant wombat circulated all over internet such as on Telegraph or even at dailymail. This Giant eating diprotodon roamed the country around 2.5 million years ago and became extinct about 55,000 years ago. Palaeontologists in Queensland said they had unearthed a virtually complete skeleton of a diprotodon, a giant wombat-like creature known for its massive tusks and tiny brain. The diprotodon, about the size of a rhinoceros, was found on a remote cattle station in an area rich in the remains of prehistoric megafauna. The discovery of a virtually complete fossil makes it one of Australia’s most significant prehistoric discoveries. Until the Queensland discovery, the most complete specimen was found at Tambar Springs in New South Wales. Scientists were excited to discover that on one rib there was a small square hole, believed to have been made by a spear while the bone was still fresh.